It may have been the hours of board game playing we did as kids, or maybe I have a touch of arrested development, but even as an adult, I LOVE a good game. Unfortunately, I’ve heard from many people, that France is not a game playing country. In fact, when I had another mother over for lunch recently and I opened up our game cabinet, she gasped in surprise. She had never seen so many games (about 20) and she admitted that their family didn’t own a single game. It was finally my turn to give the exasperated sigh and the “what for” expression. No games?!?!?! Sacré bleu! Now before you start thinking that I am June Cleaver and that playing games is some sort of hand-holding kumbaya moment for our family, think again. Games are the great equalizer and losing is a part of life. That’s why, I’m in it to win it. Every time. And if you can’t feel some satisfaction about still being able to outwit your kids, what can you feel good about? I would also like to take this opportunity to give a shout out to the Parker Brothers corporation for giving Monopoly another chance at life. Remember back to your childhood when one game of Monopoly could take days, if you could even bear to finish it? Luckily for all of us, they’ve come up with a new and improved version with a 3rd die to expedite the painfully slow process of acquiring properties. And there are skyscrapers, not just hotels. Need I say more? Mega Monopoly is genius! I only wish I was the brainchild behind that one. Disclaimer: This is not a paid advertisement (said in a robot voice). And remember my bold statement about games being the great equalizer and losing a part of life? If you take a good look at my Instagram picture of our latest Mega Monopoly game above, you might notice a young hand rolling the dice with the nice lineup of property and cash along side it. Those hands would be Owen’s. If you look very carefully at the other side of the board, you will see a lovely lineup of mortgaged property. That is my side of the board. What you cannot see is the lowly 4 white bills in my clammy hand (that’s exactly $4 for you non-Monopoly players – no joke). Take that, sucka……………I mean, Mommy! Not sure that France is quite ready for Mega Monopoly yet, however. I think we should start with some card games and work up from there. Euchre anyone? 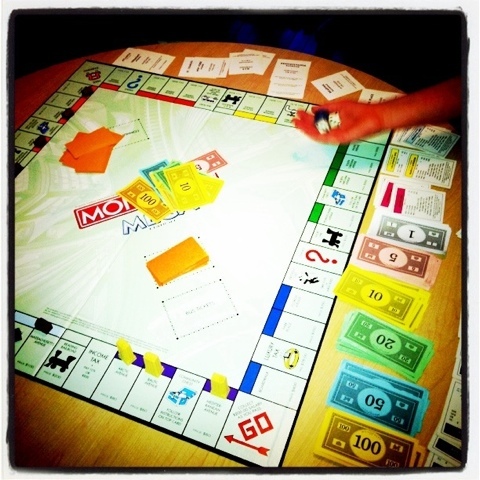 This entry was posted in culture and tagged games, mega monopoly. Bookmark the permalink.